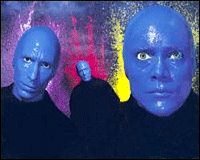 We went to see the Blue Man Group yesterday - it was fantastic. They threw me a marshmallow. And I ate it. Great stuff.